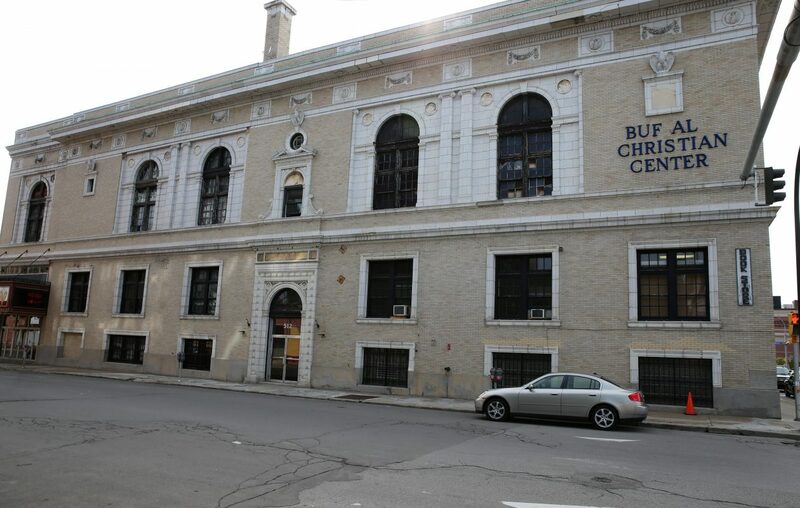 Ellicott Development is hoping Erie County will help it offset the cost of renovating the Buffalo Christian Center as part of a larger, $75 million project to build a new 12-story building on Pearl Street. Ellicott, owned by Carl and William Paladino, is seeking sales and mortgage recording tax breaks from the Erie County Industrial Development Agency to support the adaptive reuse of the 67,000-square-foot building at 512 Pearl, which is mostly vacant except for Road Less Traveled Productions. Plans call for converting the former Christian Center into 60,300 square feet of mixed-use space that will include professional meeting and banquet use; commercial or theatre space; a combination lounge, cafe and bar; an indoor pool; and a fitness center with locker rooms, a steam room and sauna. An additional 6,700 square feet will be office space. The Christian Center portion of the work is expected to cost $7.245 million, including the $2.575 million cost of acquiring the property. Ellicott is asking for $184,406 in sales tax breaks and $54,337 in mortgage tax breaks, and plans to apply separately for a city property tax incentive. ECIDA will hold a public hearing on the project on at 9 a.m. Monday at its 95 Perry St. office. Comments will be accepted through Aug. 22. The renovation is part of a larger project to construct a 12-story, 300,000-square-foot tower on the site of a former 100-space parking lot next door. That tower will include six floors of parking, a three-story hotel, two floors of 28 apartments, 28,000 square feet of office space and 12,000 square feet of ground-floor retail. 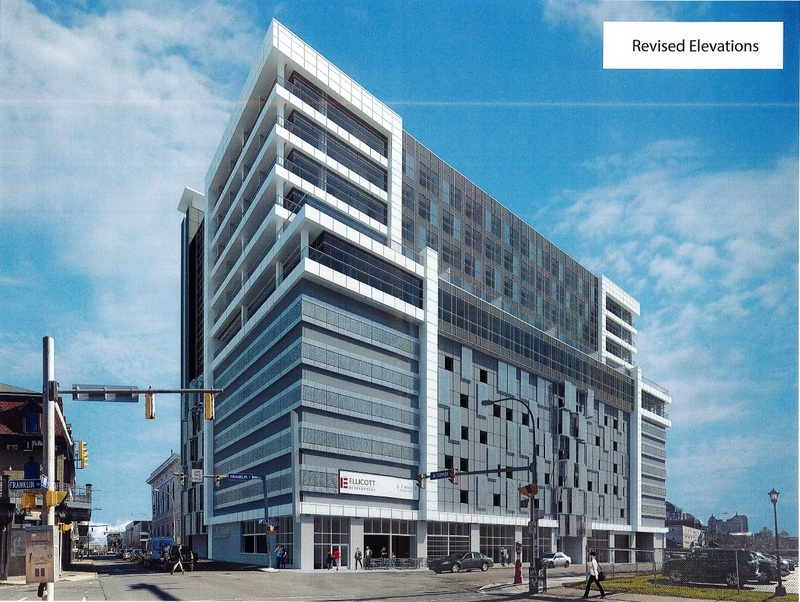 A rendering of Ellicott Development's plan for the building, facing Franklin Street. The Buffalo Christian Center building will house the main lobby, lounge, cafe, banquet and meeting areas, pool and spa, and back-of-the-house functions for the hotel. Road Less Traveled will remain in the Forbes Theatre. The Christian Center left the building in 2014, before Ellicott's purchase, but had only been using 30 percent of the building, with minimal programming as its operations declined over several years. Ellicott now needs to bring the building into compliance with current codes, as well as clean up any environmental contaminants, structural repairs and undoing some previous modifications to the structure. As part of that renovation work, the developer is fixing the external masonry, restoring the original windows and decorative plaster on the interior and installing new vertical circulation, a fire-suppression system and restrooms. But that's costly, and rental rates in Buffalo are not enough to overcome the financing gap without help, the developer noted in its application. And lenders are reluctant to provide enough money to meet the projected need. "Like other adaptive reuse developments that we have undertaken, the viability of this project is plagued in many ways, requiring a need for every available resource to finance and yield a modest return," Ellicott wrote. "Redeveloping a timeworn and long-underutilized structure results in a series of extraordinary costs that are not confronted in new ground-up development ... With the ECIDA's assistance, we are able to tighten the gap in project financing, and breathe new life into a long-underutilized and poorly maintained structure." The building, originally home to the Fraternal Order of Eagles, is eligible for up to $935,000 in historic tax credits, and Ellicott plans to follow strict federal and state guidelines for the work under the National Park Service and State Historic Preservation Office. The project, which was approved by the city Planning Board, is projected to be completed and open by July 2018.